I thought my first blog post was February 26th 2012, but it seems the correct date was February 19th. However, it's visible that the blog just completed its first anniversary! Firstly, I'd like to thank very much every reader: the numbers are just incredible. It grew up very much this year and gained two brothers - the Flag Review and the Flags of U.S. States -, although, for me, they are almost the same blog. Some flag-istic goals I'd like to achieve before the next birthday. Between parenthesis, an approximated chance to achieve it. 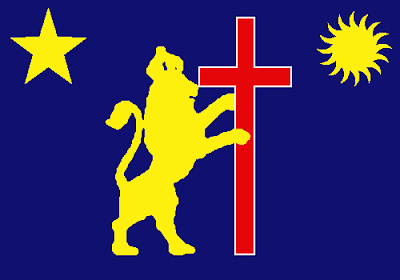 Establish a Brazilian vexillology society (30%). Next year I'll see what we completed. My personal favorites of the year. I'd like to see your favorites, too. And you, what's your favorites? Please, leave a comment. No, I'm not giving iPhones. The way I chose to thank for the reader is the following: choose any subject (yes, anything!) and I'll design a proposal to it, the soonest possible. Don't be afraid, don't be shy, participate! Thanks again, thanks a million times! This post is specially open to suggestions, critiques, questions, etc. Don't forget to give your comment! Sorry, I had to take a pause to celebrate, but a new flag in next week! The Channel Islands is the name used to collectively refer to the islands in the English Channel, that divides the Great Britain and the France (and the rest of continental Europe). 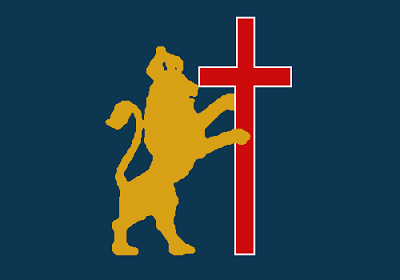 They are constituted by two different British crown dependencies, Jersey and Guernsey, reminiscent of the Duchy of Normandy. 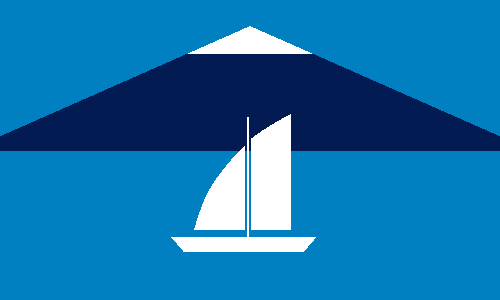 There were discussed on Flags Forum about the possibility of a possible independent federated Channel Islands. 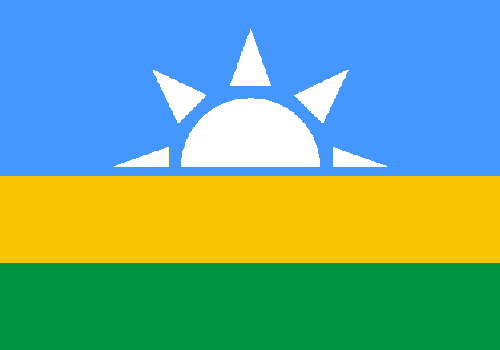 I prefer to discuss about a "cultural Channel Islands flag". I don't think the best flag would merge the Jersey and Guernsey, for many reasons: it looks like a science fiction or alternate history flag (they use very much that resource) and it would look very unoriginal considering its neighbor and dependent of the United Kingdom, specially because traditional Guernsey flag is identical to St. George's cross and traditional Jersey flag is identical to St. Patrick's cross. However, if you disagree with me, you can see some proposals on the link below. 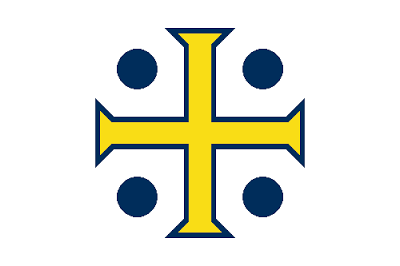 The great advantage of this flag is that it's very inserted on Channel Islands root, while not resembling the symbols used in United Kingdom properly nor in French Normandy; so it's very adequate to be used as a "Channel Islands cultural flag". What's your (good or bad) opinion about this post? Please, leave a comment. Next week is blog's first birthday's special post. Wait! Many elements are common on both flags: the blue and white backgrounds, the golden star and sun and the red cross. The common symbolism is very obvious: blue is for sky, white stands for peace, star is for the Brazilian federation, sun for climate but also energy, strength, cross for Christianism (the 1817 Revolt is also known as the "Priests' Revolt"). 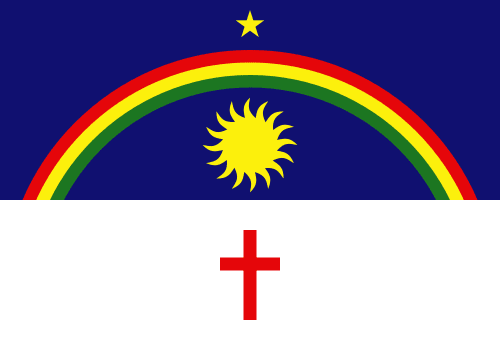 The Pernambuco flag has a rainbow, standing for people's pluralism. Exclusive to Recife flag, there are the Latin motto "Virtus et Fides" ("Force and Faith") and a crowned lion, related to both Pernambuco's nickname "Leão do Norte" ("[Brazilian] North Lion"), because of its history of engagement, and the coat of arms of the Prince John Maurice of Nassau, the administrator of Dutch territories on Brazil (whose headquarters were on Pernambuco) that transformed Recife (then "Mauritsstad") in one of most developed cities of American continent at the time. I think the last, however, is the most probable of being adopted. Your comment is very important. Please, leave a comment! If possible, follow the blog. Now that I am talking about Carnival and Recife, a curiosity: according to Guinness Book, Recife has the big Carnival parade of the world, the Galo da Madrugada ("Midnight Rooster"). In 2013, it's claimed to have united 2.5 million people (Recife has only 1.5 million inhabitants). 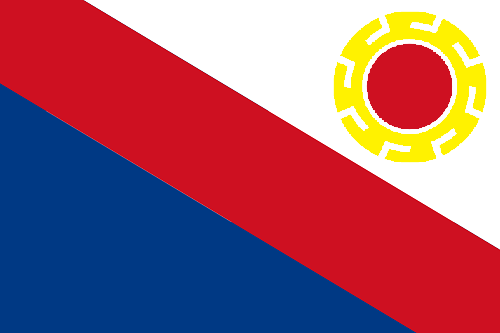 This is a flag that I done some time ago, but waited to publish because I was doing too many posts about Chile. But I think it's a good time to publish what I consider one of my best flags. 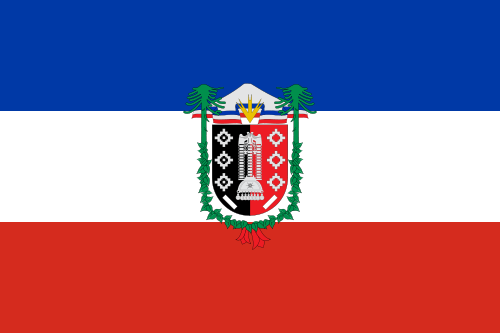 This flag is a blue-white-red tricolor; I really don't know what these colors mean. The shield, however, is interesting: it consists of a black and a red partition, with six white rhombuses, symbols very used in Mapuche art, and a white tapalacucha, a Mapuche neck jewel. The coat of arms is ornamented by a copihue (native flower), a snowy mountains and two araucarias, a common tree in the southern South America and very abundant in the region. 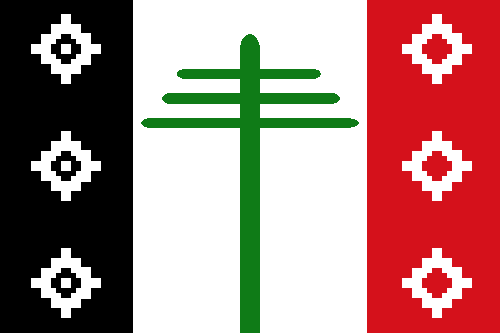 A small change in the flag would be changing the stripes colors by the flag of the Kingdom of Araucanía and Patagonia, a government-in-exile ruled by a French monarch and a council of Mapuche tribal chiefs, but it could generate controversy over non-indigene Chileans. 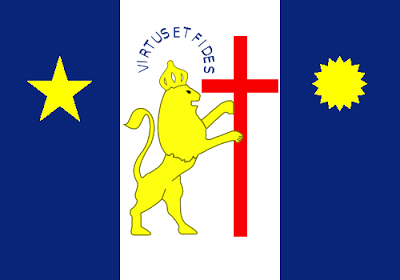 The first and third stripes are taken from region's coat of arms. In central stripe, a stylized araucaria, a symbol with strong local identity. 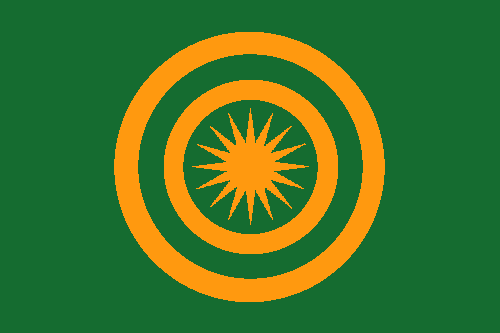 I think it would fly well in Araucanian skies. Your comment is very welcome! If you're interested in blog posts, you can receive blog updates on Google Reader or your preference e-mail. Subscription boxes are in the right of the page.